Owners – Cruickshank and Co.
She was still afloat in1863. 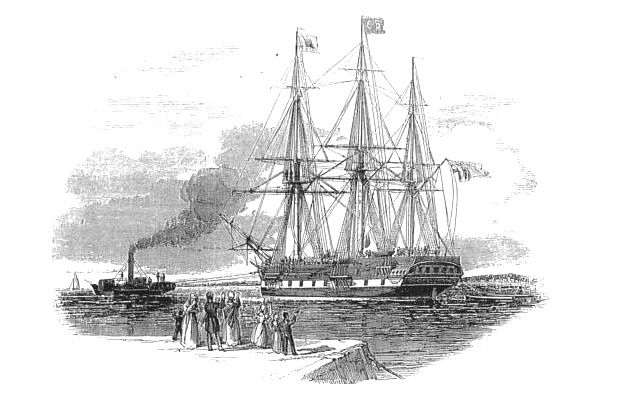 Emigrant Ship “St.Vincent” shown here departing Deptford, England bound for Sydney, Australia ('The Illustrated London News', April 13th, 1844 Image No.14945) Remarkably this pen sketch records the exact moment in time that our family line seperated from its ancestral homeland. The St. Vincent has had a favourable passage from Cork, arriving here in 105 days. She crossed the line 30 days after sailing; made St. Paul's in 77 days and would have completed her voyage in 95 days, had she not been detained, when about 100 miles to the westward of Cape Otaway, ten days from light easterly winds. She has, however, arrived all in good health, having had no disease of a contagious nature on board. Five deaths occured, children under two years of age, and three births, since leaving Cork. Total number of emigrants 264, principally agriculturists, with the exception of, as high as we could ascertain, 21 or 22 mechanics, consisting of 8 stonemasons, 9 carpenters, 3 tailors, and 1 gardener. 157 were shipped at Deptford - 30 married couples, 8 single females, 20 single men, and 69 children, from 1 to 14 years of age: 107 were shipped at Cork - 13 married couples, 38 single females, 22 single men, and 21 children, from 1 to 14 years of age. This Ship was also featured in several articles and sketches by the “ILN” on the 13th April 1844, the very voyage George and Sarah Verrall undertook. Description: An 'Illustrated London News' engraving showing life below deck on the emigrant ship 'St Vincent' (1829). Once used as a convict ship, the 'St Vincent' sailed from Deptford on 8 April 1844 with 165 emigrants to Sydney. She stopped in the West Country and at Cork, Ireland (known as Queenstown while under British rule) to take on additional migrants. Most of these emigrants had received special government grants that subisidised settlement in the colonies. The offer was open to families, single men 'of good character' and a proportion of single women between eighteen and thirty, who had been in domestic or farm service. The Illustrated London News stated 'The future well being and respectability of the colony [Australia] mainly depends on the good conduct of the working classes'. A. The hospital for females, fitted up with six bed places (one of which is prepared and devoted to accouchments. B. The hospital for males, with four bed places. Between A and B are 48 bed places, each 6 feet by 3 feet, for married people above, and for their children below, every one furnished with bedding, pegs for clothes, and each divided from the adjacent bed place by stout planks. From the men's hospital (B) a bulkhead goes across the ship to separate that part of the vessel forward, which is appropriated to the single men and youths, whose bed places number 46, and every one sleeps alone in a bed 6 feet by 2 feet. Between C and D are 24 bed places for married people (as on the opposite side), a bulkhead then goes halfway across the deck, and runs in the amidships to the stem, enclosing the apartment of the single females, and containing 24 bed places, each 6 feet by 3 feet, as two are required to sleep together. Along the whole of the amidships are tables with fixed seats, and beneath the tables are plate racks and battens to hold small casks containing the daily allowances of fresh water, provisions, etc. It will no doubt be in the recollection of many, that a Government grant was made to assist families and single men, agricultural labourers, shepherds, carpenters, smiths, wheelwrights, bricklayers, and masons, being of good character, to emigrate to Australia, limiting the number, we believe to five thousand. Amongst these were to be included a certain portion of single women and girls, between eighteen and thirty years of age, who had been in domestic or farm service. Her Majesty's Colonial Land and Emigration Commissioners entrusted that important undertaking to Messrs. Carter and Bonus, of Leadenhall-street, who have been engaged for several years in the management of emigration to Australia, Canada, etc., and from what we have witnessed, it could not well be in better hands. The trust is certainly most onerous as it respects the selection of individuals to be sent out, for it must be obvious to every one that the future well-being and respectability of the colony mainly depends upon the good conduct of the working classes. There is, perhaps, something extremely melancholy at the idea of quitting our native land—perhaps for ever; the ties of kindred, the bonds of loyalty, cling round the heart, and true it is that absence only serves to strengthen the links that unite us to Home; for in whatever part of the world an Englishman may be, he still looks with ardent affection and longing desire to the spot of his nativity. But with all these feelings, dear and precious as they are on second consideration, there is not so much to excite painful sensation in emigration as at first there seems to be. A large field is opened for skill and industry; there is a prospect of gaining a competency which promises a "welcome return"; and unhappily there exists in England so much real distress, that anything in the shape of improving the condition must be grateful to the feelings. Several emigrant ships, under the direction of Messrs. Carter and Bonus, and superintended on the part of the Commissioners by Lieutenant Lean, of the Royal Navy, have already sailed—some for Sydney and others for Port Phillip—and very recently one hundred and sixty-five souls, men, women and children, embarked from the depot at Deptford, on board the St. Vincent, Captain John Young, of 628 tons (registered), and sailing the following day for Plymouth, where they received all who were assembled there from the western part of England. From thence she proceeded to Cork, to take in emigrants from Ireland, and quitted that port about the16th April, 1844, for Sydney. The ships are expressly fitted out for the purpose in the London Docks, where an active and intelligent agent is in constant attendance, and persons desirous of obtaining the advantage of a free passage must address a letter to Messrs. Carter and Bonus, stating their name, age and calling; whether married or single; and if married, the number of children. The name and address of the clergyman of the parish must also be forwarded; the period on which they will be ready to embark, and to what port of the two they are desirous of going. An answer is returned as to the eligibility of the applicants, and if they are not accepted under the bounty, a statement of terms of passage are given. Printed forms of application and testimonials are forwarded by the agents, which must be sent back for approval, together with a deposit of , one Pound for each adult, and 10 Shillings for each child between one and fourteen years of age, in payment for bedding (comprising a new mattress, bolsters, blankets, and coverlids), a small box, fifteen inches square for clothes, a knife and fork, two spoons, a metal plate, and a drinking-mug—all of which becomes the property of the emigrant on their arrival at the colony. They have also the free use of water-casks, and many necessary culinary articles. In the event of the passage not being granted the deposit is returned. On being accepted, every male must provide himself with two suits of outside clothes, two pairs of strong boots or shoes, eight shirts, six pairs of worsted stockings, three towels etc. ; and each female, besides outward garments, must possess a cloak and a bonnet. Those who desire comfort will also supply themselves with sheets and many little articles for essential use. The between decks of the St. Vincent are 124 feet in length, the breadth at the main hatchway twenty-five feet three inches, the height from the deck that is walked upon to the deck overhead is six feet four inches. From the stern of the ship, right away to the stern on the larboard side, and back again to the stern on the starboard side, the space is entirely occupied by a double tier (one above the other) of standing bed places &c. according to the annexed plan. 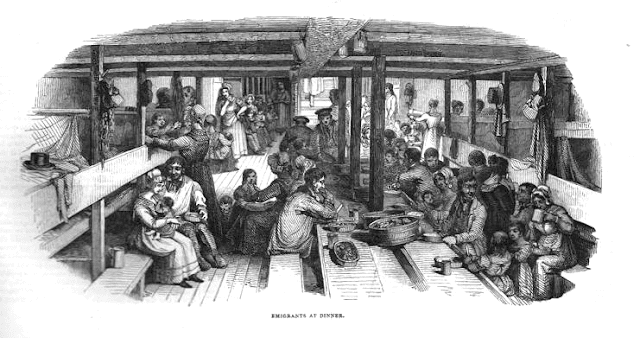 On the day before the departure of the St. Vincent from London Dock, between one and two o'clock, we witnessed the spectacle of the emigrants taking their first meal on board (good mutton, beef, potatoes, and soup), and it certainly was a most interesting scene. The married people were very decently attired, though not so much as the single, for in several instances, among the latter, both male and female, there were indications of gentility in dress and manners that caused surprise. Many had travelled long distances and, most had never before seen a ship; yet there was a display of cheerfulness that was remarkable - as if their minds were made up for whatever might betide, or that the novelty of their situations had produced an excitement, which cheered them in the hour of parting from their home, shores, and the friends they loved. Mothers were sitting giving nourishment to their infants—all were cheerful—and perhaps a more healthy and robust set of boys and girls could not well be found. The principal portion of the youths and single men were also fine athletic fellows. Among the unmarried females were several really handsome countenances and good figures. If there is any gallantry at Sydney, where, it is stated, there are 15,000 males, and not more than between 3,000 and 4,000 females, many we beheld cannot be long after they arrived without husbands. There was not the remotest indication of want or pauperism amongst the whole. One married woman, extremely handsome, was rather elegantly arrayed; she was tall and graceful, and her fashionable apparel set off her figure to great advantage. Her husband, a quiet, inoffensive-looking man, habited as a mechanic, but very neat and clean, glanced at his wife with solicitude and anxiety. Here was ample scope for the speculative mind; but what was their former history, there was not time to enquire. We give the following statement of weekly allowance made to each adult during the voyage, the children being on half allowance. (The provisions, of course, are served out daily). 4 ¾ lbs of bread, 1lb rib beef, 1 ½ lb flour, ½ lb raisins, 6 oz suet, 1 pint of peas, ½ lb of rice, ½ lb of preserved potatoes, 1 oz tea, 1 ½ oz roasted coffee, ¾ lb sugar, 6 oz butter, 5 gallons and 1quart of water, a gill pickled cabbage, ½ gill of vinegar, 2 oz salt. This taken singly, is adequate food, but when united in messes (say of ten) where appetites are not equal, is certainly not bad living, and we have not heard of any complaints. After the emigrants have arrived in the colony, they are allowed ten days free access to the ship, with all its advantages, should they not be hired or obtain employ at once. The number of emigrants the St. Vincent will convey is about 240, and from the general characteristic of those we saw on board, they will prove a valuable acquisition to the colony. The St. Vincent appeared to be a fine vessel, well found and may the Almighty prosper her voyage! Like Hope, half soothing wild Despair! Yet-what's the wintry waste they leave? Alas! All hearts with theirs must grieve! May never meet another day! Obscures the gloom of endless night! And memory, vainly, wish them near. Where they expected them to find! Then seek the wide-wide world again! Farewell to those now left behind! Many a gentle heart to ache! Of our once happy nation's race! More cause for thy disturbing sake? How can we hope step-dame's relief? "Better to bear the ills we have"
Than seek in foreign climes a grave! The convict ships, 1787-1868, by Charles Bateson. 2nd ed. 1974. Departed London 22 November 1852, arrived Hobart Town 30 May 1853, units carried - 58th, 65th (2nd Yorkshire North Riding) Regiment of Foot, - notes - convict ship, source – DNZ (This would account for the different departure dates). ILN Reference, Yr. 1854, Vol. 25, Page 57. Index to Illustrations of ships, ports and places, and other items of general interest to Australia and New Zealand 1842 to 1891 inclusive. Compiled by Vaughan Evans, 1988. The Illustrated London News is available on microfilm produced by University Microfilms, 300 North Zeeb Road, Ann Arbour, M1 48106 or at 3/32 Mortimer Street London, Win 7RA, England. (Their Reference: 0019-2422). 'True Patriots All' by Geoffrey C. Ingleton, Published by Charles E. Tuttle Company, Rutland Vermont.